Whether you are a Troop Committee member, a Scoutmaster or an Assistant Scoutmaster, we have training to get you up and running as fast as you need! Once completed, you are eligible to wear the “Trained” patch for your position. Scoutmaster Leader Specific Training is designed to help the new Scoutmaster and his/her assistants understand their new leadership position. Troop committee members are also encouraged to attend this one-day course to learn about the program they are supporting. Click here to find out about upcoming courses, and to sign-up online. Introduction to Outdoor Leader Skills is a hands-on program that gives adult leaders the practical skills to lead Scouts in the out-of-doors. The skills taught will introduce the participants to the basic Scout outdoor skills from Webelos through the Boy Scout First Class rank. This course is offered in a single weekend format in the fall, or a two-Saturday format in the spring. Click here to see when you can take this exciting class, and to sign-up online. Youth Protection Training is designed to help you keep our youth safe from abuse. It covers the BSA’s Youth Protection Guidelines, the Guide to Safe Scouting, signs of abuse, and how to report suspected abuse. It is required training for every leader before registration, and it must be renewed every two years. Click here to contact our Training Chair to find out when you can train all your troop’s leaders and parents. Individuals can also take this training module online at my.scouting.org. Troop Committee Challenge training has been developed to help troop committee members better understand their roles and responsibilities in support of the troop, Scoutmaster and Scouts. This training is best when delivered to all of the troop committee at once. 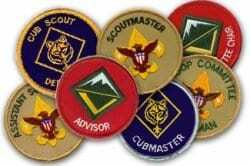 It should also include the Scoutmaster and, if possible, Assistant Scoutmasters. Click here to contact the Training Chair to find out when you can train your entire troop committee! Individuals can also take this training module online at my.scouting.org. Wood Badge is the advanced leadership training program for all adult leaders in the BSA. It is intended to increase leadership skills for Cub Scout, Boy Scout, Varsity Scout and Venturing leaders, as well as council and district leaders. Click here to find out about our course offerings.